Whether you need it for basic home use, use at the station or construction site, or to simply add to your home evacuation pack, here are 10 worthwhile rechargeables LED flashlights. 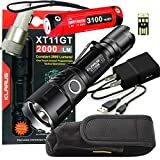 While this flashlight is on the upper end of the price spectrum, the features offered by this flashlight compensates for the hefty price. It boasts an LED bulb that can last for up to 50,000 hours. It recharges to full power in 3 hours and lasts up to 5 hours on a single charge. Although it isn’t weatherproof, its water proof capabilities ensure that it is useful for any type of customer. This super lightweight flashlight has a lot to offer in terms of features. Although it is pretty waterproof, do not assume that it is weather proof. 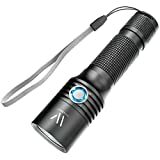 However, with 6 different brightness settings and 2 flashing modes, this flashlight can be used for any purposes, from patrol to calling for an SOS. On the lowest setting, this flashlight can run up to 170 hours on a single charge. Small, and very light in weight, this flashlight comes with five different operating modes: high beam, low beam, medium beam, strobe, and SOS. This device is perfect for everyone, from hunters to law enforcement to dads looking for things in the attic. It is ideal for any type of weather and can withstand any amount of water or snow that it’s under. Although the lack of a firm grip may pose a problem in dire or extreme situations, this flashlight is perfect for everyone and their wallets! This flashlight is incredibly lightweight and easy to store. Because it lacks the ability to ensure the user a firm grip, it not ideal to purchase this for job purposes. It offers a beam for up to 140 hours with one single charge. 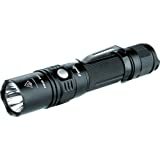 For the medium-range of pricing, this flashlight is ideal for emergency situation usage. 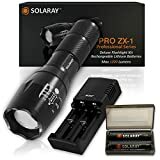 At this incredibly cheap price for an LED flashlight, this Solaray meets the basic expectations of a personal LED flashlight. Despite its price tag, it is a very good quality flashlight. But due to its cheap price, longevity is not a factor to hope for when buying this flashlight. It is good for the occasional use, but not built for extreme purposes, such as extreme weather or daily use. Despite its rather heavy weight for a personal flashlight, this flashlight has a lot to offer. It provides up to 290 meters of visibility in the darkest of nights. It comes with three beam settings: high beam, low beam, and strobe for signaling someone or disorienting an invader. Although it is not incredibly weather proof, it is water proof and its durable body ensures the long life of the battery itself. 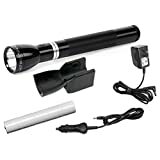 Even though it is not intended for use under extreme conditions, such as snow or heavy rain, this flashlight has a lot to offer. With up to 36 hours of life with a single charge, this flashlight is ideal for emergencies or even for daily use. It provides a steady single beam of light up to 494 yards. That’s an insane amount of visibility! Although it is very expensive, this flashlight ensures that this will be the last flashlight you will ever buy for a long time, if ever. But the price is the only downside for this flashlight, though. Its solid and durable body ensure that it can withstand water and all the other elements. It also houses a wide beam when cast, and has a very long range, even at the lower settings. With a long-lasting bulb and durable body, buying this flashlight is only a one stop shop. An incredibly cheap personal flashlight that offers the basic requirements of an LED light without robbing your wallet. 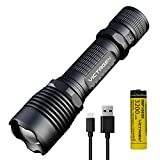 With up to 6 hours of battery life, this flashlight is perfect for emergency use, but not ideal for single, extended periods of use. It’s light weight and small body makes it incredibly easy to carry and store. 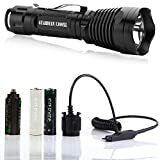 With three different outdoor settings (standard outdoor, law enforcement, military/tactical) this flashlight goes beyond the basic requirements of a personal flashlight. Its versatility makes up for it short-life bulb and the narrow stream of light, rather than a wider beam. Approved by the National Tactical Officers Association, this LED flashlight is water resistant and resistant to rain and snow.